Heat oven to 425°F. Spray cookie sheet with cooking spray. Unroll dough on cookie sheet; starting at center, press out dough into 14x12-inch rectangle. Brush dough with olive oil; bake 7 minutes. 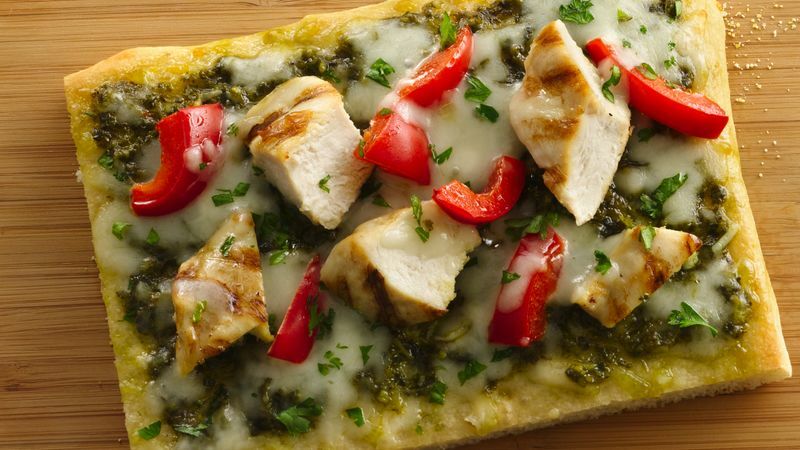 Spread basil pesto over crust; top with remaining ingredients except parsley. Bake 10 to 13 minutes longer or until crust is deep golden brown and cheese is melted and bubbly. Sprinkle with parsley. To serve, cut pizza into 4 rows by 4 rows, making 16 pieces.